Bout of Books ... you know the readathon that I posted about earlier? You know the readathon where I try to read more than usual? Yeah, that's not really happening for me! So far, I have only finished one book, Watchmen by Alan Moore. BUT, today I hope to get better and do a lot more reading. I just need to choose my next book! I knew the beginning of the week was going to be hectic and that the latter part of the week was going to be better on the reading front. I was NOT expecting my reading to be quite this bad! 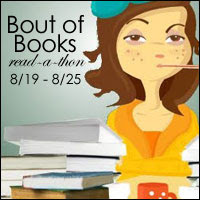 Keeping my fingers crossed that the rest of the readathon goes better than I was expecting! !